The most important and most used feature in world of Virtualization is the ability to clone a VM,take snapshot of the current state of a VM, Live migrate a VM, e.t.c. Lately i have been playing with KVM and Openstack Cloud computing platform.At times you have to clone a VM to use it for a different project and in this small guide, i will show you how to do it using virt-clone command. virt-clone is a command line tool used for cloning existing virtual machine images that uses libvirt as hypervisor management library. Follow steps below to clone a vm on KVM. 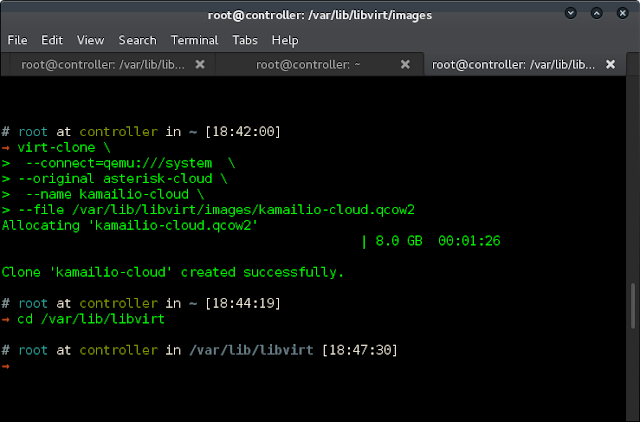 Make sure the VM you wish to clone is powered off.Use command below, just replace “asterisk-cloud” with your vm name. kamailio-cloud.qcow2: Image saved that kamailio-cloud boots from. Check to confirm that kamailio-cloud.qcow2 file is successfully stored in /var/lib/libvirt/images folder. If you now run the command virsh list –all, you should see cloned vm present in the list. Look for the line below and change original domain name to point to new clone. Modify below configurations to fit your use cases. That’s all. You should have a running/working cloned Virtual Machine. You can also do this form graphical interface using “Virt Manager”.